After the development of the Sino-Italian Aerospace Platform as a working platform for Italian and Chinese enterprises we are starting now to get into the details of the cooperation program that was officially signed by Premier Li Keqiang and Prime Minister Matteo Renzo in Beijing last June 2014. 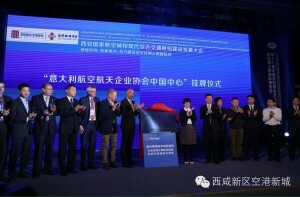 One of the most important achievements is represented by the development of the Sino-Italian Aviation Enterprises Valley between the Italian Aerospace Network (IAN) and Shaanxi Xixian Airport New City (IAN). The MoA signed at the Embassy of Italy to the People’s Republic of China last March 2015 during the visit of Deputy Minister Carlo Calenda between IAN and ANC is taking into effect. The IAN Chinese Hub was officially launched last May 21st 2015 in China at the Shaanxi Xixian Airport New City facilities. The IAN Chinese Hub integrates the developments’ plans of the Italian Aerospace Network to expand its own presence along the most aviation and aerospace oriented areas in the People’s Republic of China. The IAN Chinese Hub is located in Xi’an, Shaanxi Province, People’s Republic of China. Specifically it takes place into the Shaanxi Airport New City area, which represent the new starting point of the Air Silk Road that will efficiently link China to Italy. Shaanxi Airport New City covers a wide 50 km2 area next to the Xi’an International Airport, which is set to become a 4th generation airport for comprehensive transportation of passengers and goods in the North-West part of the Country. Shaanxi Airport New City is one of the main Maintenance Centers for domestic China Eastern Airlines’ operations and it is one of the largest logistic hubs of the whole Country. Shaanxi Province excels in the aviation industry: it represents the 25% of the total national manufacturing output and welcomes 300 Aviation Manufacturers, 6 Research Institutes, 4 Aviation Polytechnic Institutes, 3 State Owned Enterprises. Italian Aviation & Aerospace Enterprises have a long historical background that goes back to the beginning of the last Century. Today Italy is well known for its main contractor (Finmeccanica) and for over 1500 Italian enterprises that supply high tech solutions internationally. Italian Aerospace Network keeps supporting the communication and the upcoming business opportunities between Italy and the People’s Republic of China.